PureFunds ISE Junior Silver ETF utilizes its assets to purchase stocks of small cap companies that are involve in silver exploration and mining. In 2014, it has a year to date return of 22.07%. This index ETF funds is tracking ISE Junior Silver (Small Cap Miners/Explorers) Index. The total assets are only $1.69 million. Its expense fee is 0.69%. This ETF has an average volume of 6k shares. The current shares price is $11.38. The top 5 stocks in its holdings are Fortuna Silver Mines Inc, Endeavour Silver Corporation, Silvercorp Metals Inc, MAG Silver Corporation, and SilverCrest Mines Inc. The top sector is basic materials. Ranked with 1 star by Morningstar, Global X Gold Explorers ETF has no yield. This top performing exchange trade funds in 2014 invests mainly in companies that are part of Solactive Global Gold Explorers Index. Its expense fee is only 0.65%. The 52 week price range is between $12.82 and $13.51. The top 3 stocks in its portfolio are B2Gold Corp, Novagold Resources Inc, and Gryphon Minerals Limited. There is also zero yield for this best ETF. SPDR S&P Biotech ETF is an index ETF fund. This best performing ETF in 2014 is tracking the S&P Biotechnology Select Industry Index. The current dividend yield is 0.17%. Popular among investors or traders, it has $1.2 billion of total assets. The annual expense ratio is only 0.35%. 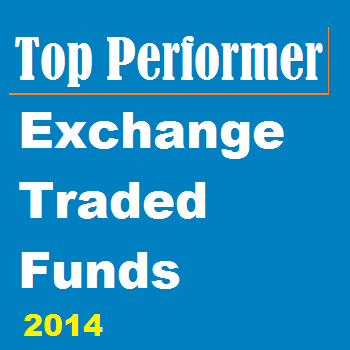 Morningstar has ranked this top performing ETF in 2014 with 2 stars rating. In 2014, its YTD return is 20.32%. This health sector ETF has returned 34.68% over the past 3 years, and 24.26% over the past 5 years. The top 3 equities are Intercept Pharmaceuticals Inc, Neucrine Biosciences Inc, and Ariad Pharmaceuticals. Guggenheim Solar fund has a share price of $41.77. This top performing exchange traded fund in 2014 uses its assets to purchase companies in the MAC Global Solar Energy Index. This index ETF has a 12-month yield of 1.28%. The total assets are $392 million. Its expense fee is 0.70%. This alternative energy ETF has an average return of 129.26% for the past year. The top 4 stocks in its portfolio are Solarcity Corp, GCL-Poly Energy Holdings Ltd, Canadian Solar Inc, and Yingli Green Energy Holding ADR. The top 3 countries are China, United States, and Hong Kong.